LANSING, Michigan -- Montrell Marshall knew the pressure sat squarely on his shoulders Tuesday night. The Dayton Dragons first baseman came to the plate in the bottom of the 10th inning of the Midwest League All-Star Game with the score tied, a runner on second base and two outs. Both sides already were told that the 10th would be the final inning, so Marshall could have been the final out in a game that ended in a tie. "It came down to me, and I wouldn't have wanted it any other way," Marshall said. "I want to be in that situation every night if I can." The Reds prospect delivered, lining a two-out single to the gap in right-center field to score Dayton teammate Stuart Fairchild and give the Eastern Division a 3-2 victory over the Western Division in front of 9,396 fans at Cooley Law School Stadium. "I knew I had the power to just throw the bat head at the ball," said Marshall, who was named BUSH'S® All-Star MVP. "I knew I couldn't strike out. I had to put the ball in play." 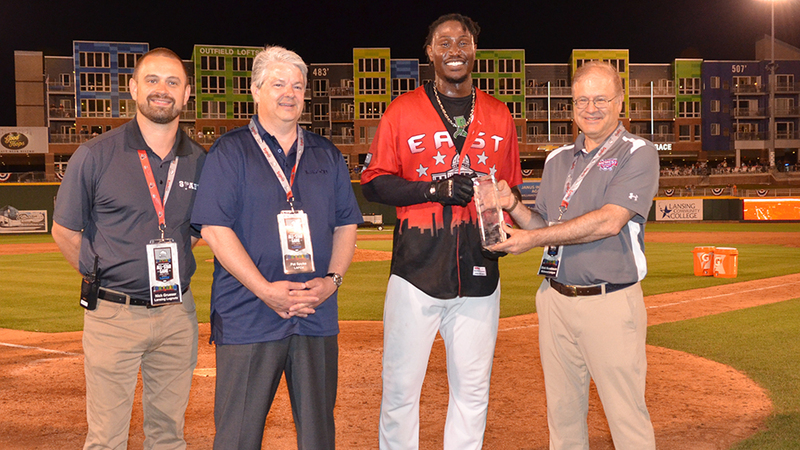 While Marshall earned the MVP award, the stars were the 28 pitchers who saw action. The teams combined for 15 hits and 20 strikeouts and struggled to scrape together runs as the hurlers did not issue a walk. "We knew this was a game that would pit one good team against another good team," said Eastern Division skipper Cesar Martin, who manages the Lansing Lugnuts. "When you have good pitching, it's often ahead of the hitting, even if it's good hitting." The Eastern Division scored first when leadoff man Kevin Vicuna of the Lugnuts doubled to open the bottom of the first, then raced home when on a single up the middle by Bowling Green's Taylor Wells. The Western Division came close to tying it in the fifth. Wisconsin's Demi Orimoloye led off with a single, then stole second and took third on a wild pitch by Lugnuts right-hander Maximo Castillo. Wisconsin's Payton Henry lined a ball up the middle that struck Castillo and rolled back toward home plate. Castillo picked it up and threw to South Bend catcher Miguel Amaya, who tagged out Orimoloye. "I asked [Orimoloye] if he wanted to go on contact or make the ball go through," said Western Division manager Mickey Storey of Quad Cities. "He said he wanted to go on contact, so I said, 'Let's do it.' He got a good jump and did everything developmentally correct. But the ball hit the pitcher and the pitcher made the play." The Eastern Division doubled its lead in the bottom of the inning when Great Lakes' Jared Walker lined a 1-2 pitch from Quad Cities'Parker Mushinski over the ivy that covers part of the right field fence for a home run. But the Western Division got on the board in the sixth against Cubs No. 23 prospect Javier Assad of South Bend. With two outs, Burlington's Julio Garcia lined a ball off the fence in deep center for a double that scored Peoria's Yariel Gonzalez from first base. The East threatened to add to its lead in the seventh when Bowling Green's Moises Gomez beat out an infield single and moved to second on a wild pitch with two outs. But he was picked off by Peoria catcher Dennis Ortega to end the inning. The West tied it with two outs in the eighth as Gonzalez singled off Bowling Green's Tommy Romero, who threw a wild pitch that pushed Gonzalez to second. Twins No. 5 prospect Alex Kirilloff of Cedar Rapids followed with an RBI single. When the game moved to the 10th, the West failed to move its designated runner beyond second base. It appeared the same fate was about to befall the East before Marshall's heroics. "I thought it was a really good game played by both sides," Martin said. "Both sides had good defensive plays as well. Marshall's at-bat was a great swing, and a great way to end a great game." Storey agreed, adding, "I thought it was a phenomenally played game -- by both sides. Our guys swung the bat well and didn't have a lot to show for it. There was a lot of hard contact, but a lot of balls hit right at guys. If this was my team in a regular-season game, I would have told my guys they had played a really good game -- and lost."